Just months after a complete revamp of its website, NBC News is previewing a new look and feel for its homepage. The new site, which debuted in February amid much fanfare, has been widely paned by users, so it’s not surprising the network is already retooling the site. The new design retains some of the large photography blocks that the network touted so strongly, but tones them down significantly and loses the full width design and devotes about half the homepage to text-only headlines. The new site also features a smaller navigation bar that sheds the “hamburger” menu that hides news categories in favor of a more traditional horizontal listing of topics. Overall, the new design represents a much “safer” approach that certainly helps address many of the complaints raised by users. That said, it also seems a bit uninspired and cluttered. 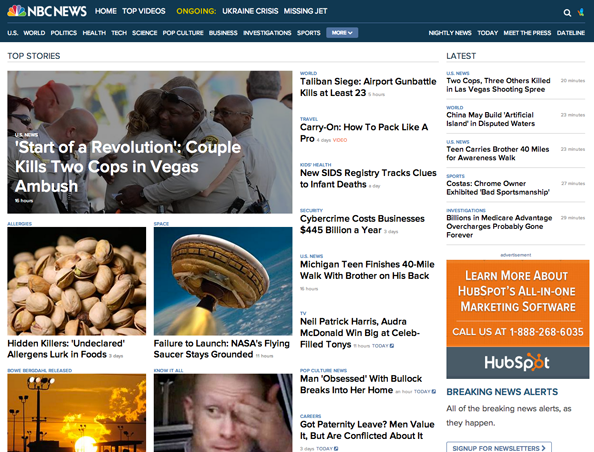 Preview the new homepage look at http://preview.nbcnews.com/.